The large-scale expansion of agriculture in the Amazon through deforestation will be a no-win scenario, according to a new study. Published today, 10 May, in IOP Publishing’s journal Environmental Research Letters, it shows that deforestation will not only reduce the capacity of the Amazon’s natural carbon sink, but will also inflict climate feedbacks that will decrease the productivity of pasture and soybeans. The researchers used model simulations to assess how the agricultural yield of the Amazon would be affected under two different land-use scenarios: a business-as-usual scenario where recent deforestation trends continue and new protected areas are not created; and a governance scenario which assumes Brazilian environmental legislation is implemented. 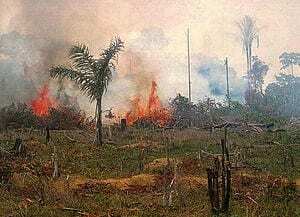 They predict that by 2050, a decrease in precipitation caused by deforestation in the Amazon will reduce pasture productivity by 30 per cent in the governance scenario and by 34 per cent in the business-as-usual scenario. Furthermore, increasing temperatures could cause a reduction in soybean yield by 24 per cent in a governance scenario and by 28 per cent under a business-as-usual scenario. Brazil faces a huge challenge as pressure mounts to convert forestlands to croplands and cattle pasturelands in the Amazon. A fine balance must be struck, however, as the natural ecosystems sustain food production, maintain water and forest resources, regulate climate and air quality, and ameliorate infectious diseases. Lead author of the study, Dr Leydimere Oliveira, said: “We were initially interested in quantifying the environmental services provided by the Amazon and their replacement by agricultural output.